First Night Alexandria is a family oriented, non-alcohol New Year's Eve celebration held on December 31 at dozens of venues throughout historic Old Town Alexandria. 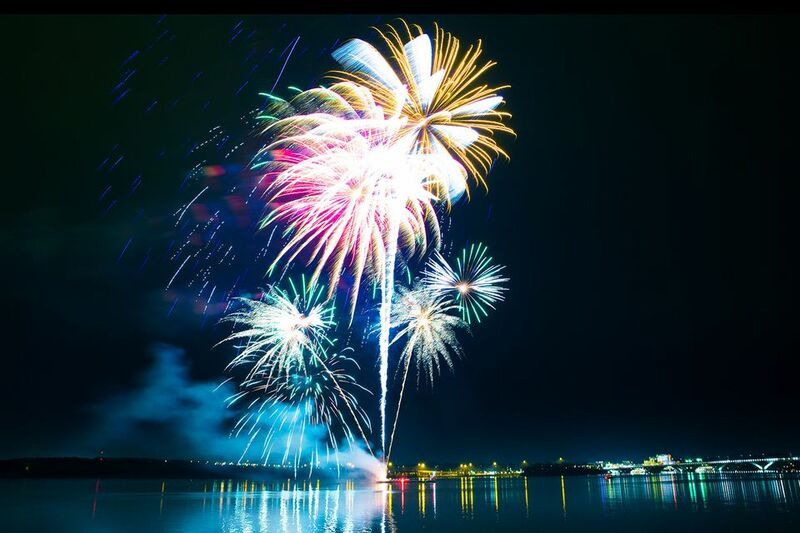 This year's celebration will include more than 100 live performances at more than 30 venues, the Annual Fun Hunt, plus children’s entertainment and interactive games, and a spectacular midnight finale with fireworks over the Potomac River. The best viewing is from anywhere along the Potomac River. The barge will be offshore at the end of King Street. Annual Fun Hunt and Free Activities: 2-5 p.m.
Live Performances throughout Old Town: 7-11:45 p.m.
Fireworks Finale: The finale will kick off at 10 p.m. as music will fill the streets for an outdoor dance party. Fireworks will be set off at midnight, along the Potomac River at the foot of King St. Dozens of museums, public buildings, and even retail shops are turned into performance venues to showcase regional and national talent. Activities for kids include face painting, moon bounce, balloon sculptures, interactive games, storytelling, and sing-alongs. Dance the night away at the George Washington Masonic Memorial and the Torpedo Factory Art Center with a wide range of music. Start your New Year’s Eve fun in the afternoon with the Annual First Night Fun Hunt, a scavenger-style hunt that uses puzzles and clues to take teams to sites around Old Town. Everyone that completes the hunt clue sheet is eligible to win great prizes. The Battle of the Local Stars returns with teenage musicians competing for a paid performance spot at next year’s event. Additional First Night activities range from tasting events to interactive art lessons and pet-friendly gatherings hosted by the Animal Welfare League of Alexandria. $30 before December 30; $35 on December 31. Children under 12 and active military are free. Admission badges may be purchased online. Badges can also be purchased in person at the Alexandria Visitors Center at Ramsay House, 221 King Street. On December 31, all First Night venues will have badges for sale beginning 15 minutes prior to the first performance. Admission badges will also be available beginning at noon on December 31 at the Durant Arts Center, 1605 Cameron Street. Every venue will sell badges (cash only) beginning 15 minutes before the first performance. All First Night Events after 11:30 p.m. are free. Metro Stations: King Street, Braddock Road, Eisenhower Avenue, and Van Dorn. King Street Trolley: The trolley is free and is the best way to get from the King Street Metro Station to the Old Town Alexandria waterfront area. The trolley will operate until 1 a.m. and will make a continuous loop from the King St-Old Town Metro, to First Night headquarters at the Durant Arts Center (1605 Cameron Street), then to the George Washington Masonic Memorial (101 Callahan Drive) and back to the Metro. DASH Bus Service: The Alexandria Transit Company provides bus service within the City of Alexandria, and connects with Metrobus, Metrorail, Virginia Railway Express, and all local bus systems. Hilton Hotel Old Town - 1767 King St.
King Street Metro Place - 100 Duke St.
King Street Station - 1800 Diagonal Rd. US Patent and Trademark Office - 551 John Carlyle St.
City Garage - 108 N. Fairfax St. only $3 after 5:00 p.m.